This beautiful, rural home is fully modernised and very stylishly decorated. 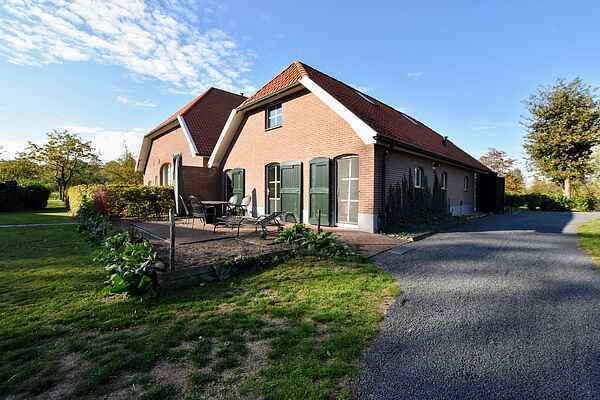 The holiday home is beautifully located on a large estate in the Achterhoek. This stunning and modern house was built as a rural home. From the outside, the house is reminiscent of a farmhouse, but on the inside, straight lines, modern materials and tasteful furniture are combined into a very stylish and sleek home. In the large living room you can enjoy the cosy fireplace. The house also has two large bedrooms with private bathrooms and a fully equipped kitchen. On the two patios, you can nicely enjoy the tranquility and the sun. The house is in a very quiet and natural location. Despite the tranquility, the house is centrally located. For example, you can get your daily shopping within 3 km in the cosy center of Aalten. Also within 3 km lies a beautiful forest where you can take lovely walks. If you would rather spend the day swimming, you can do this within 3 km of the house too, as you can find both an open-air as well as a covered swimming pool there. A visit to Germany is a very viable option from here. In other words: something for everyone.